My 2x great aunt Jovita García was the sister of my great grandmother Jesús García de Alvarado. Great Aunt Jovita was born 7 Mar 1893, probably in Ensenada, Baja California, the youngest of nine children. She came to California with her mother, María del Rosario Moraila de García, around 1910, settling in Santa Paula and working there packing citrus fruits with her sister María del Rosario, called simply “Rose.” Their father, Francisco García, had died some 14 years previously in Sonora. In 1914 Jovita had a son, Ricardo Hernando, born 9 Jan, son of José Díaz. Little is known of what happened to Díaz; he was not in her life for long, and in fact is gone by at least the 1920 U. S. Census. By this time it appears the talented Jovita was already an entertainer in silent-film Hollywood, performing mainly as a dancer. On 31 May 1921 she married attorney Harvey Gawen Higgins (1893-1990), a native of York, Ontario. She later married Harry G. Cunningham (1890-1978), a cameraman from Colorado, on 17 May 1966. After Cunningham’s death she moved with her son Ricardo “Richard” Higgins and his family to New Zealand, where she eventually died 28 Jan 1984. Family oral history says that Great Aunt Jovita taught Rudolph Valentino to dance in the living room of her mother’s North Hollywood home. This was reiterated to me more than once by my Great Aunt Cecilia Anastasia Alvarado de Hernández before she died in 2008 at the age of 99. However, it is well-known that Valentino was an accomplished dancer before he arrived in California. In fact, as I understand it, his dancing was how he supported himself, flirting with smitten wealthy women. 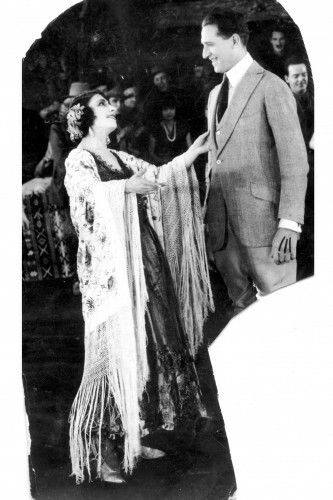 There are two possibilities to explain the story: either it was not Valentino but some other actor that was mistaken for him by Great Aunt Cecilia, who would have been about 10 or 11 years old when she watched the couple dance, or Jovita was not teaching Valentino but rehearsing with him. Could she have been preparing him for the famous tango scene in the classic film “The Four Horsemen of the Apocalypse” (1921)? What films did Jovita work in? A trip to the archives of the Academy of Motion Pictures Arts and Sciences did not provide any answers, but later after being contacted by my New Zealand cousins (who found me through this blog), they gave me a photograph that may lead to some answers. It is the photo below, of Jovita with a “famous director” whose name was lost in the passing down of the photo. The experts at the Academy archives were also unable to identify the director. In the photo Jovita appears to be on set in costume, talking to the director. The costume, extras and background are similar to the tango scene from the 1921 classic. At least it is clearly a silent film. If we can identify this director, we can probably then learn what movie this photo is from and begin to detail Jovita’s career, as we may be able to learn her screen name. There will be more to write about Great Aunt Jovita, but if anyone out there can help identify the director or even the film set, we can begin to learn more about her amazing life. 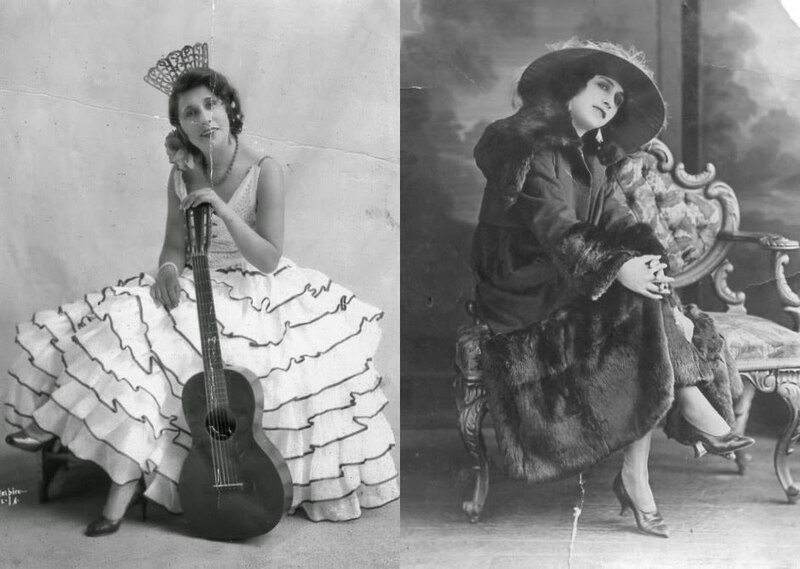 For reference, here are a couple of other publicity photos of Jovita. Always intestine finding new things about the Moraila’s. Appreciate the info. Not to mention I love how the Moraila’s are indirectly related to the Germans. No wonder I’ve been fascinated by the German language and culture. My father always mention Manuel Moraila from Sinaloa. I’m sure there is relevance along the lines. Would really like to meet our blood lines. Cheers! Go Bayern München! I am a descendant of Georg Stoltz who came to America with his family from Germany in 1738. Sometime around the Civil War it became Stultz. I started a Facebook group called “It’s StUltz” I have been contemplating on a name change. Anyone who is or was a Stoltz/Stultz is welcome. It’s a private group but anyone can approve you.